My video race of the week for Saturday, August 2 is the Grade 1 Whitney Handicap Saratoga. It is carded as the 10th race for 3-year-olds and up traveling a mile and an eighth on the main track (Post Time- 5:46pm ET). Even money favorite Palace Malice puts his perfect 2014 (4-for-4) record on the line. Chinks in the armor are hard to find but if you are looking to topple him, he has been beating up on seconditis horses such as Goldencents, Normandy Invasion, and Golden Ticket. Also, 3 of his 4 wins this year have been around one turn (one mile), so perhaps he prefers that trip right now. Moreno is the target but he does not like to win vs. this type. Itsmyluckyday should be close throughout but appears best up to 8.5f. Will Take Charge likes this course-distance but was better late last year and early this year. Ditto Last Gunfighter. Departing has upside with only two starts this year including a close 3rd in the G1 Stephen Foster. Romansh is inconsistent and Golden Ticket has not won in quite some time. Prayer for Relief seems a cut below. Click here to view today’s free Pick 6 & Late Pick 4 Tickets from Saratoga! My video race of the week for Saturday, June 14 is the Grade 1 Stephen Foster from Churchill Downs. Revolutionary, my 2013 Derby-Belmont top, is the 2-1 morning line favorite. He will try to get involved late but there is not a ton of pace in the paper race. Will Take Charge is the 5-2 second choice. He started to show fatigue in his erratic Oaklawn Handicap stretch run and threw in a clunker last time in the Alysheba at Churchill Downs. I will try to beat him until he shows some oomph. Departing, at 9-2 on the line, was my Preakness pick last year. He returned with a solid score under the Twin Spires and might be ready to rejoin the stakes ranks. Last Saturday at Saratoga Race Course, it appeared as though Golden Ticket was going to shock the world at 33-1 in the Travers but post time favorite Alpha wanted to be part of the party as well and surged late to share in the spoils. Golden Ticket saved all of the ground under David Cohen and needed every advantage to tie with my top ranked sophomore Alpha, who sat an outer stalking trip under Ramon Dominguez. Golden Ticket will have to prove that he is more than a one-hit wonder before he joins my top ten. I began my Derby Top 10 list right after Del Mar/Saratoga in September in 2010 and 2011 and will do the same this year. In an interesting side note, my initial number one in 201o was Stay Thirsty and Alpha was the early juvenile boss this time around. Both Bernardini colts went on to capture the Jim Dandy and Travers during their sophomore campaigns. Maybe I should rename my future road to the Derby blogs for the Travers trail! Dullahan traveled west and toppled salty older foes Game On Dude and Richard’s Kid in the G1 Pacific Classic at Del Mar on Aug 26. He sure adores synthetic, specifically Polytrack, and is probably the best in the business on that footing. He crashes back to earth on conventional dirt so if he ends up in the Breeders’ Cup it will likely be on turf. Since my last report, Paynter resumed training at the Spa but got sick again and is fighting colitis at a clinic in New York. Bodemeister, Hansen, and Street Life have all been retired. It has been a tough year for the sophomore class with numerous injuries and premature retirements. Checking in with former top ten members, B Shanny won a sprint at the Spa on 8-12. Consortium recently returned to the worktab for Kiaran McLaughlin, and Fire On Ice and O’Prado Again are getting close to a race. 1. Alpha (Bernardini) – Controlled the pace in Jim Dandy and stalked/pounced his way to a share of the Travers (100 BSF) title on Aug 25. The Pennsylvania Derby at Parx on 9-22 could be next. 2. Paynter (Awesome Again) – Gave Union Rags a run for his money in the Test of Champions and looked great capturing his first graded stakes in the Haskell. He is currently battling colitis at a clinic in NY…get well soon. 3. Dullahan (Even The Score) – Ran his Polytrack record to a perfect 3-for-3 in the Pacific Classic (111 BSF). Let’s see if Romans and company can avoid the temptation to try dirt again. 4. Gemologist (Tiznow) – He came out of the Derby with a foot bruise and spit the bit in his disappointing Haskell return. He breezed 4f in :48.15 (6/54) at Saratoga on 8-26 and could meet up with Alpha in the PA Derby. 5. Fed Biz (Giant’s Causeway) – Baffert’s highly regarded colt returned in the pink at Del Mar (El Cajon Stakes) on Aug 31. He could be a major player in the Strub Series this winter at Santa Anita. 6. Nonios (Pleasantly Perfect) – Haskell place finisher ended up 5th in the Travers. He handles dirt but might be better on synthetic. 7. Neck ‘n Neck (Flower Alley) – Late bloomer gamely chased Alpha home in the Jim Dandy and finished 6th in the Travers. He does his best work at Churchill Downs. 8. Jimmy Creed (Distorted Humor) – Gave Fed Biz everything he could handle in El Cajon. Mandella’s $900k purchase appears tailor-made for Santa Anita’s G1 Malibu on Dec 26. 9. Summer Front (War Front) – Lost for first time on turf in G1 Secretariat but was hardly disgraced in show finish. Look for him to cut back in distance next time as ten panels is a bit beyond his range at this point. 10. Unbridled’s Note (Unbridled’s Song) – Unlucky G1 King’s Bishop show finisher probably would have won that heat with clear sailing. Asmussen trainee looks like and up and coming sprinter. This is the final chance to earn Kentucky Derby 2012 graded cash and morning line favorite Castaway can make the gate on the first Saturday in May with a win in the Grade 3 Coolmore Lexington Stakes at Keeneland on Saturday. #7 Castaway (3-1) had his goose cooked on the front end in the G3 Sunland Derby. The Baffert trainee captured the slower division of the G3 Southwest before that and landed the place in his synthetic bow at Del Mar last summer. He won’t offer much value and could be in trouble if pressured early. #6 Holiday Promise (6-1) had the light bulb turned on after adding blinkers Feb 20. He exits a fine place finish in the G3 Spiral and is working well at Keeneland. He has enough positional speed to keep the leaders in his sights and should offer a hint of value for Alvarado/Pletcher. #11 Gold Megillah (10-1) finished 3rd in Turfway’s Rushaway last out and the top two came back to run well. The Graham Motion trainee needs to work out a trip from the outside post under Johnny V.
#10 News Pending (5-1) put his name on the map following a place finish behind Union Rags in the G2 Fountain of Youth. He never got involved in the paceless G1 Florida Derby but has some tactical ability and would not be the first turf horse to handle Polytrack. #8 Hammers Terror (30-1) rates a longshot look. He ran well in both Polytrack starts last year and showed some ability at Fair Grounds this season. A tactical trip under Albarado is anticipated. 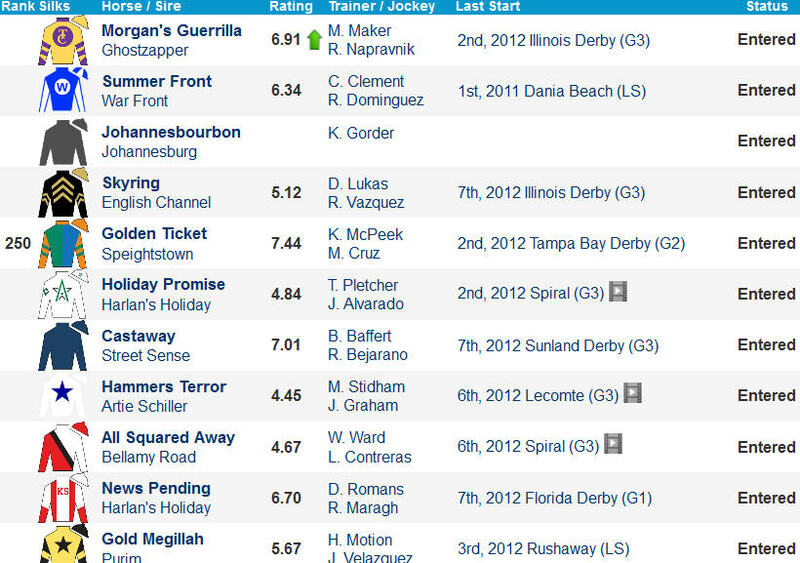 #1 Morgan’s Guerrilla (6-1) was last seen landing the place from post 12 in the G3 Illinois Derby on April 7. The early-pressing type should save all the ground under Leparoux and still has a shot to make the Derby field with a win. #2 Summer Front (9-2) nabbed all three of his turf starts last year for Clement. The $475k purchase is firing Payson bullets for this and shows up in an ambitious spot off the shelf. #3 Johannesbourbon (8-1) easily captured his Turfway sprint bow and the distant runner-up came back to tally. He stretches out and looms a pace factor at the very least in this salty spot. #5 Golden Ticket (6-1) rallied for the place in the G2 Tampa Bay Derby. He raced evenly in both local sprints and will try to get involved late. #4 Skyring (30-1) stumbled at the start, raced wide, and split the field at 45-1 in the Illinois Derby. He will probably stalk the pace under Court with a clean beginning. #9 All Squared Away (50-1) made a wide move before flattening out in the Spiral. Wesley Ward has him now and he excels with new additions to his barn. This one could end up being a pace casualty. The Tampa Bay Derby is in the books and Prospective stamped his ticket to Kentucky Derby 2012 with a solid victory over Golden Ticket on Saturday. Prospective donned the hood and showed much improved positional speed in a 3/4ths length tally over Golden Ticket and Cozzetti at Tampa Bay Downs on March 10. The final time was moderate but Prospective is getting better and seems like the type to make a longshot run on the first Saturday in May. He is a cut below the best at this stage and figures to have one final Derby prep (Wood Memorial?). He has now accumulated $365,432 in graded earnings. Golden Ticket gave the aforementioned winner a scare but could not quite go with him late while well clear of rallying show finisher Cozzetti. Spring Hill Farm was the post time favorite for Todd Pletcher but he failed to handle the added distance and finished an even 4th. The final graded route prep at Tampa Bay Downs for Kentucky Derby 2012 hopefuls will be run on March 10 and the full field is reduced by one with the defection of Take Charge Indy. #10 Take Charge Indy (3-1) added a touch of class to this event and figured to make his presence felt throughout but his connections opted to scratch and wait for the G1 Florida Derby at Gulfstream Park on March 31. #1 Prospective (8-1) overcame a wide trip from post 11 to land the place in the G3 Sam Davis here Feb 4. He captured the G3 Grey as a juvenile at Woodbine and began his sophomore campaign with a victory in the seven panel Pasco at Tampa Bay Downs. He dons the hood and should save all of the ground from the cozy rail. #6 Cozzetti (12-1) has not lived up to expectations for Romans but he continues to train well and barn is known for striking in graded Derby preps (Paddy O’Prado, Shackleford, Dullahan, News Pending, Finnegans Wake). #7 Battle Hardened (9-2) graduated in the G3 Sam Davis and is on the upswing for Kenneally. A tactical trip is expected. #9 Spring Hill Farm (5-2) is 2-for-2 in sprints and the promising Pletcher trainee is bred to go this far. He looms a pace factor at the very least under Castellano. #2 Golden Ticket (12-1) finally graduated in his sixth lifetime start for McPeek. He ran well in both route starts and is getting better but gets tested for class here. #4 Chief Energy (12-1) makes his first start in more than six months for new trainer James Toner. He traded decisions with My Adonis last year and probably needs the race. #8 Ravelo’s Boy (12-1) rallied to finish 4th in the Sam Davis at 69-1. The late runner can clunk up for a minor award once again. #5 Tell All You Know (15-1) is 2-for-2 over the local main track but has never raced around two turns and meets other speed. #12 Cajun Charlie (15-1) exits three straight Delta Downs wire job tallies vs. Louisiana-bred foes. He meets much better company and must work out a forwardly placed trip from the outside post. #11 Fox Rules (30-1) has failed to threaten in four stakes starts since graduating in a turf route at Saratoga last summer. #3 Twin (30-1) is ambitiously spotted after earning his diploma in his 12th career outing at the Gulf.